"Don't be fooled," says New York Gov. Andrew Cuomo. "The worst is still coming." 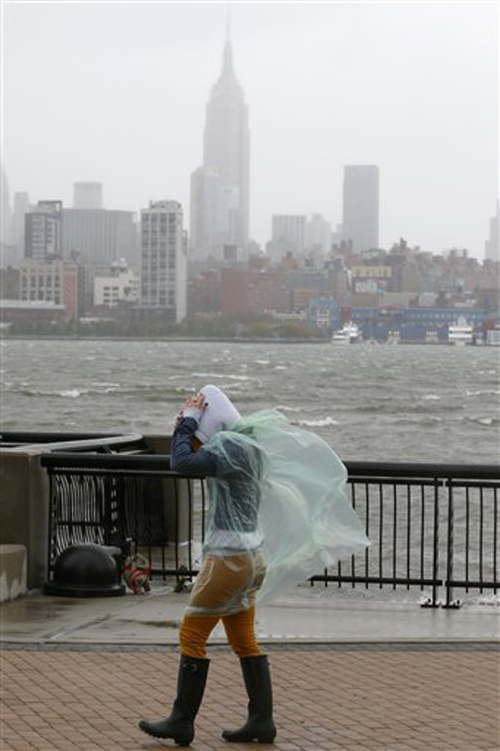 NEW YORK — Waves splashed over the sea walls at the southern tip of Manhattan, already at Hurricane Irene levels Monday hours before the worst of a mammoth storm was to hit the nation’s largest city with a wall of water that could reach 11 feet. Gov. Andrew Cuomo closed two key tunnels to downtown Manhattan and the city canceled schools for a second day after shutting its mass transit system and ordering hundreds of thousands of people to leave their homes ahead of Hurricane Sandy’s storm surge. While light rain fell steadily and several New Yorkers still bustled on the streets, officials warned residents to get out of the way. By midday Monday, minor flooding had affected some Long Island fishing villages and coastal towns, New York’s Rockaway peninsula and a highway on the east side of Manhattan, officials said. More than 20,000 customers, mostly in Long Island, had lost power; most of the city’s 3,600 outages were in Brooklyn. The floor of the New York Stock Exchange was deserted in its first unplanned shutdown since the Sept. 11, 2001, terror attacks. Cuomo closed the flood-prone Brooklyn Battery and Holland Tunnels, by Monday afternoon. And Mayor Michael Bloomberg canceled school for the second day Tuesday, saying “there’s no chance that mass transit will be back in time” by then. “Leave immediately. Conditions are deteriorating very rapidly and the window for you getting out safely is closing,” he said.